Orange County Arts and Cultural Affairs celebrated the installation of four new large-scale artworks for its third annual Sculpture on the Lawn exhibition on June 26 with an evening reception. Music and activities were held inside the Orange County Administration Center for guests to enjoy. An outdoor walking tour of the new pieces, led by Orange County Arts and Cultural Affairs Director Terry Olson, was provided for attendees. The Public Art Review Board established the Sculpture on the Lawn program in 2015 to further its mission to include public art in Orange County for the benefit and education of its citizens while enhancing the visual environment through a diversity of styles, content and artists. The program provides access to world-class art in public spaces. The selected artists receive an honorarium in exchange for loaning their sculptures for the exhibition, which continues through May 2018. The sculptures are available for purchase from the artists. Additional support for installation was donated by Ford Kiene. The sculptures are open to the public to view on the outside lawn of the Orange County Administration Center located at 201 S. Rosalind Avenue, and are specially lighted for viewing after dark. 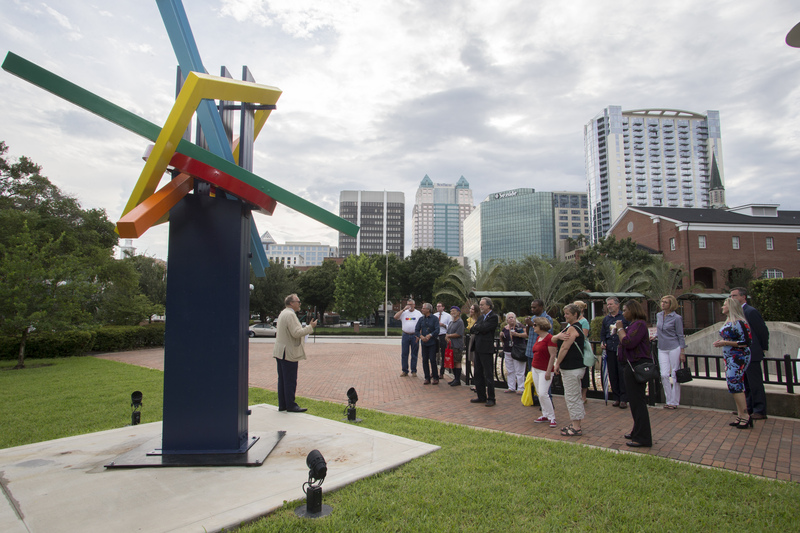 Photo Caption: Orange County Arts and Cultural Affairs Director Terry Olson leads guests in an outdoor walking tour of the new Sculpture on the Lawn exhibit at the Orange County Administration Center.